How do farmers’ behavioural attitudes affect uptake of climate change mitigation and adaptation strategies? 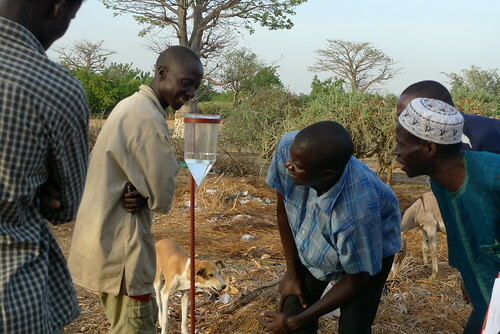 Farmers and an extension officer examine a rain gauge provided to farmers along with climate forecast information in Senegal (photo credit: ILRI/James Hansen). Farmers have different perceptions and viewpoints which greatly influence their choice of practices to cope with certain challenges such as a changing climate and its effects. These attitudes also affect the extent to which a technology will be applicable in a certain context. Thus, farmers’ context, attitudes and adoption of climate change mitigation and adaptation practices are inextricably linked. However, farmers’ behavioural attitudes towards climate change are complex and poorly understood, making difficult the development of mitigation and adaptation policies that would be accepted and implemented. 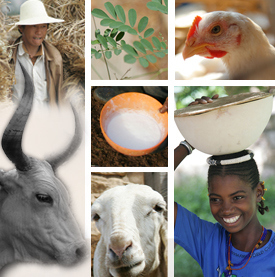 A recent study by researchers from the International Livestock Research Institute (ILRI) and the Technical University of Madrid assessed farmers’ behavioural barriers in response to climate change, taking into account the perspectives of both farmers and agricultural technical advisors. This study, which was carried out in Kenya, was premised on the hypothesis that socio-economic characteristics of farms and farmers would influence farmers’ behavioural barriers to adoption of actions against climate change. The study built on a gap identified to reveal that so far, there is no scientific literature that has clearly framed behavioural barriers related to the uptake of climate mitigation and adaptation strategies among farmers. Hence, behavioural barriers are frequently not considered in the modelling framework for climate change policy assessments. In a newly published article based on the study findings, the authors, who include ILRI’s Silvia Silvestri, present a method to model behavioural barriers in the context of the adoption of climate change adaptation and mitigation practices. The ‘Behavioural barriers in response to climate change in agricultural communities: An example from Kenya’ article emphasizes a method that frames farmers’ behavioural barriers and analyses and their main determinants in order to incorporate behavioural constraints in the modelling frameworks. The study found that a better understanding of behavioural barriers can enhance the support of mitigation and adaptation policies to farmers. From the study, it emerges that farming experience, educational attainment and access to climate information are the key factors that determine the probability of displaying or not displaying most behavioural barriers. Tags: Silvia Silvestri, Technical University of Madrid. Bookmark the permalink.